One of the greatest mysteries in American history is the fate of the lost Roanoke Colony. Founded in present-day North Carolina in 1584, it was the first English settlement in North America. But when the commander John White returned to England for supplies is 1587, he returned in 1590 to find the colony in Roanoke vanished. The precise fates of those missing settlers remains a mystery. However, a rare find during a dig at the site of the original colony gives us a clue as to how they lived. Archaeologists say these two shard of tin-glaze pottery could only have come from that time period, and must be from the original colony, Nina Golgowski reports for the Huffington Post. Tin glaze was used in the late 16th Century. 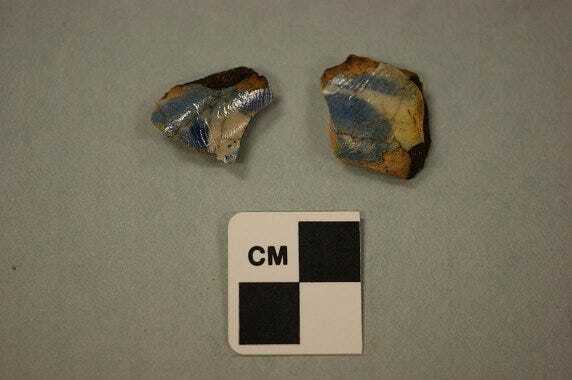 The brown and blue pieces likely come from an apothecary jar, and are currently going through analysis so researchers can see what knowledge they might glean from these fragile little shards.